I was introduced to the mighty web application in my senior high school, and web design became my mate since then. It is a never ending creation. and when I look back, it is quite a story. before I tell you about my story, lets check the story of the website and web design it self. the road he went trough, the evolution to be better and more beautiful yet powerful application everybody loves. In 1960’s there was a network that connecting some of universities, to connect, send and share information among researchers in some universities that connect together. that was the pioneer of internet connection today. at the beginning documents was the only thing they share on the network until in 1990’s Tim Berners-Lee introduced the first web browser to use on the network and Since then, the internet has continued to change and evolve, and so has web application and web design. it’s a text based web design era. the first generation web application still dominated by text, single coloumn and it’s one way information without any involvement of users. when the first generation of web application still dominated by whole text view, in the mid to late 90’s web application was introducing new features text effect, embedding images. web applications start to use marquee and blink and insert gif images in their application. this year frameset and table as a web application’s layout and flash effect is massively used. I remember that when I start to ‘browse’ on internet in 2000’s I found that most of web application I visited use frameset in their website. and flash content is being used as buttons, menus. with sound effect every time my mouse is over that buttons and menus. as a kid, It’s just toooo awesome to hear something from my computer… yeah.!!! CSS start to hit the web application. I just knew that CSS was born in the mid of 90’s but it hardly become viral because it doesn’t change the look of website much. but in the beginning of 2000 CSS become more popular to design a web. You know the best thing of CSS for someone like me is, you don’t need to stuck yourself whole days and weeks on graphic application like adobe photoshop, corel draw, fireworks etc (because graphic editing is my disabilities and I almost give up on that ) just to create a website layout like I did before I knew that I can use CSS property to make a simple border in my layout. With CSS I can do more to my web application, and I love it very much. like every web developer loves it. I was introduced to web application in the early 2000’s where CSS is widely used but unfortunately it hasn’t touch my school curriculum. my first application introduced by my teacher was Microsoft Front Page, and when I used it I was happy that I can make my own web application, with lots of text, I have marquee all over my page, and I didn’t forget to ‘blink’ my text. and it’s fun. and I didn’t know anything about CSS just yet, till my friends from another school gave me Macromedia Dreamweaver to install and in an instant I’m completely in love with this application. you can create frameset (things that I couldn’t do in FP), tables, flash button (that give sound effects hahahaaa…) is a piece of cake in DW, color blocking that don’t make any sense aaand unintended CSS. because DreamWeaver happen to automatically generate the css code everytime I change the color of my font. still, I didn’t know what CSS really is. but the curiosity is growing inside me. then the next evolution of my web application is tables, I made aaalllll my web application layout from tables, and I am happy. here I learn how to use photoshop to organize my layout. etc. but here my application evolve with better page layout, systematic information, match coloring, even is faaar away from perfect, I still love it. I, no longer play with button who play their own button effect from flash and happy to the sound effect of the button, now see the design from every point of view who make the application stand out. it is far away from perfect, far away to be called as a website who catch people attention and I am still learning. I have my late start up, but I won’t stop learn. I make my progress here and I love every bit of CSS and I, if you are too lazy to use CSS or such, trust me. use it. if you fail and your design isn’t fill you up, try to look at other website for inspiration and try again. don’t give up. and when you already at the point where you mastered (yet still feel soo hungry) it will be the evolution of yours, my friend. and when you look back, there will be lots of story you can tell and appreciate. Two days ago I became one of the speakers on “Indonesia Awan Pengetahuan” workshop with another 4 speakers ( Mr. Wawan, Mr. Syawal, Mr. Sumarli, and Mr. Sukisno). The purpose of the workshop is to educate teachers of all level about basic computer, internet, mind mapping, and office. And show them how to optimizing all the resources they’ve learned to build a strong and powerful subject for the students. This article supposed to be delivered on the workshop, but because of several problems, this idea was slightly missing on the list. hahahahahaaaaa…… so I’ll post it here instead. Disamping formula – formula built-in yang memang sudah ada di excel, kita juga bisa membuat fungsi tambahan dengan menggunakan Macro. berikut ini adalah tutorial untuk merubah angka menjadi huruf terbilang dari angka yang di maksud. 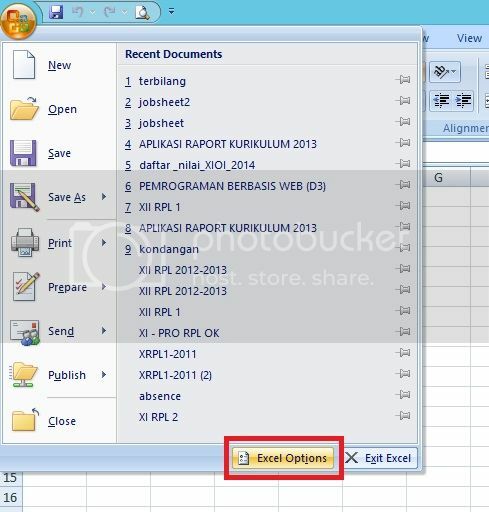 Untuk menggunakan fungsi terbilang ini terlebih dahulu anda download file macro (add-in) yang akan membantu kita menggunakan fungsi terbilang. Note me of the link broken. note : let me know if the link is broken..